Make some room on your pantry's cereal shelf. 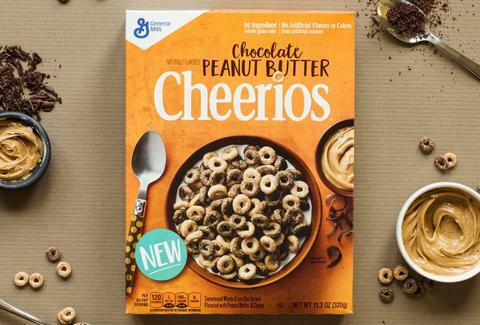 Cheerios is releasing a brand an all-new chocolate peanut butter flavor, and it's about to overtake Honey Nut as you go-to favorite among the many versions of the classic cereal since it was first introduced in 1941. Basically, it'll be like eating spoonfuls of Reese's Peanut Butter Cups for breakfast. First spotted by the eagle-eyed folks at Candy Hunting, Cheerios officially confirmed the news of the candy-inspired version online via social media by teasing its arrival with a photo of the new packaging (shown above). We've reached out to General Mills for details on exactly when boxes of this new version of the iconic oat O's will hit shelves, but for now you'll just have to hang tight with its promise of "real soon." The real question, however, is this: will you be able to finish a 4,000 calorie bowl of 'em?